The Queen, accompanied by The Duke of Edinburgh, has officially opened the new National Cyber Security Centre in London. The National Cyber Security Centre (NCSC) is the UK's authority on cyber security. As part of GCHQ, it works to make the UK the safest place to live and work online; reducing the cyber security risk to the UK by improving its cyber security and cyber resilience. Upon arrival, The Queen met the Director of GCHQ, Mr Robert Hannigan, and Ciaran Martin, the CEO NCSC, before touring the team workspace. The new building in Victoria will accommodate approximately half of its 700 employees, with others based in partner organisations such as GCHQ. The Duke of Edinburgh chats to members of staff at the National Cyber Security Centre in Victoria, London. Around half of its 700 employees, with others based in partner organisations, including GCHQ. During the visit today The Queen and The Duke heard about some of the cyber threats facing the UK, both in the present and future, and how the NCSC will tackle them. Her Majesty and His Royal Highness explored the history of GCHQ history and the creation of the NCSC, and took great interest in the Second World War Royal Household telephone directory and a book of secret cyphers used by The Queen's father, King George VI, to communicate during the war. 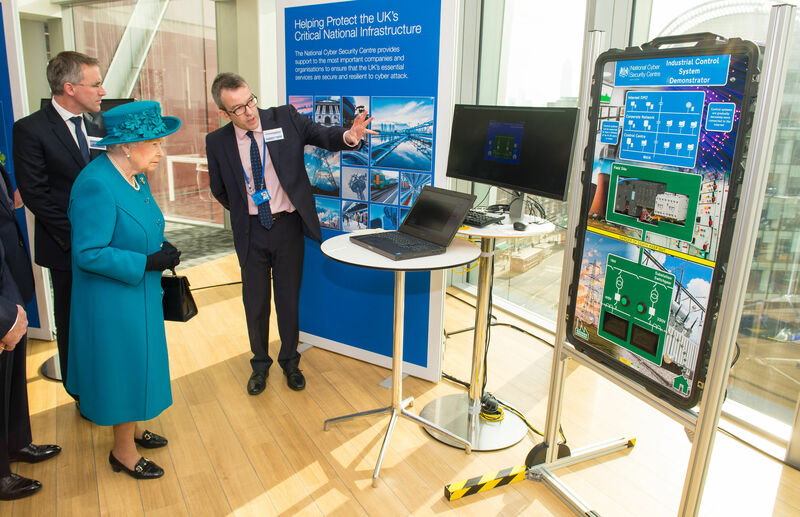 The Queen and The Duke of Edinburgh then viewed exhibition stands demonstrating current NCSC work, and watched as staff triggered a mock cyber attack. The Royal Party were then invited into the 'home of the future' which demonstrated the threats faced in the future and how they will be tackled, from risks associated with robot vacuum cleaners to how hacking an interactive children's toy could override home security systems. Before unveiling a plaque to mark the official opening, The Queen and The Duke met girls taking part in GCHQ's CyberFirst girls competition, a national challenge to develop girl's cyber security skills and find the decoders of the future. One of those introduced to Her Majesty and His Royal Highness was 12 year old Cerys who applied for the competition via encrypted email, which first had to be decoded by GCHQ.